Stellar cartoonist Daniel Warren Johnson (Space Mullet), with colorist Mike Spicer (SHIRTLESS BEAR-FIGHTER! 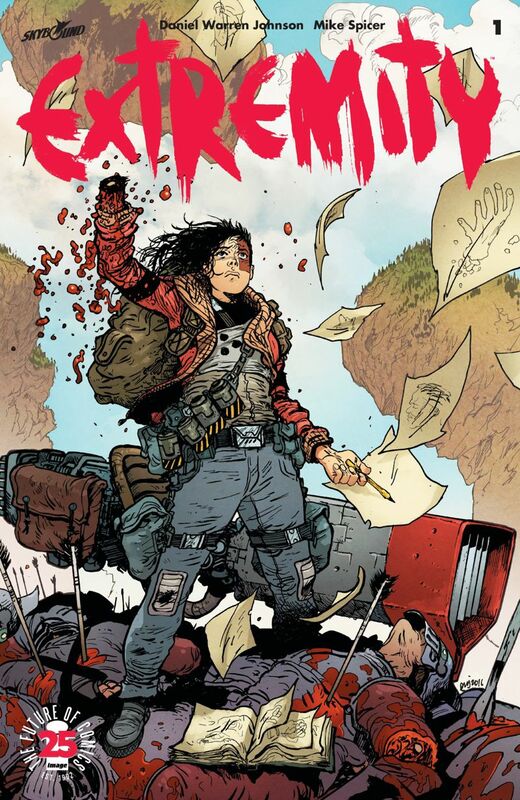 ), will release the first trade paperback collection of his series EXTREMITY this September from Image Comics and Skybound Entertainment. Thea dreams. Not of a better life, but of revenge on the clan that ruined her family. With ferocious battles between man, machines, and monsters ahead…who knows where her quest for vengeance will take her? EXTREMITY is a bold new vision, where the beauty and imagination of Studio Ghibli meet the intensity of Mad Max. EXTREMITY VOL. 1 (Diamond code: JUN170645, ISBN: 978-1-5343-0242-6) arrives in comic book stores Wednesday, September 6th and bookstores Tuesday, September 12th. The final order cutoff deadline for comics retailers is Monday, July 10th. EXTREMITY VOL. 1 is available for preorder.